Katie Wagoner is a native of Buhler, Kansas and now resides in Roeland Park, KS. She currently is an assistant band director at Park Hill South High School and Lakeview Middle School in Kansas City, MO. She completed an Undergraduate Degree in Music Education from the University of Kansas studying with Dr. Margaret Marco. 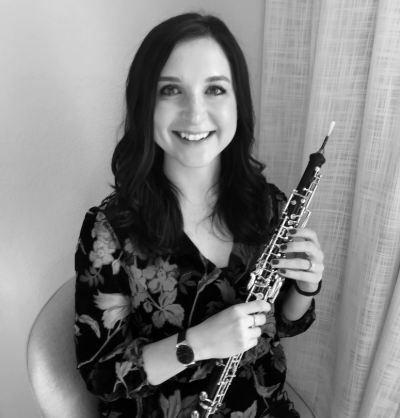 After student teaching in Blue Valley, she continued on to complete at Master’s Degree in Oboe Performance from the University of Michigan studying with Dr. Nancy Ambrose King. Along with being a full-time band director, she keeps busy with a private oboe studio and woodwind clinician in the Kansas City metro. She enjoys spending time with her husband and two dogs, Farley and Frankie.